We are a destination; not many people find themselves “just passing by” and because of that, we need to think differently about shopping. That’s why we’ve created “The Vaillancourt Experience.” Starting with Vaillancourt Retail Gallery, we’ve designed an open space for both the casual shopper and serious collector. The gallery focuses on the Vaillancourt Chalkware and Ornaments displayed among other gifts and collections. Because our retail gallery is spacious, we’re able to literally move walls and install architectural elements that create unique and fun vignettes. Whether you’ve come to shop or simply want to sit on the couch and be inspired (especially when coming for our Christmas Decorations), you’ll find that our retail gallery is ideal for both. To go one step further, the retail gallery overlooks our Artist’s Studios where you can watch each fine art quality chalkware piece being painted before your eyes. Need more? Near the back portion of our retail gallery is our Christmas Museum, where you can take a step back in time to see how we’ve interpreted Christmas throughout the years. We’ve tried to reinvent shopping around The Vaillancourt Experience. 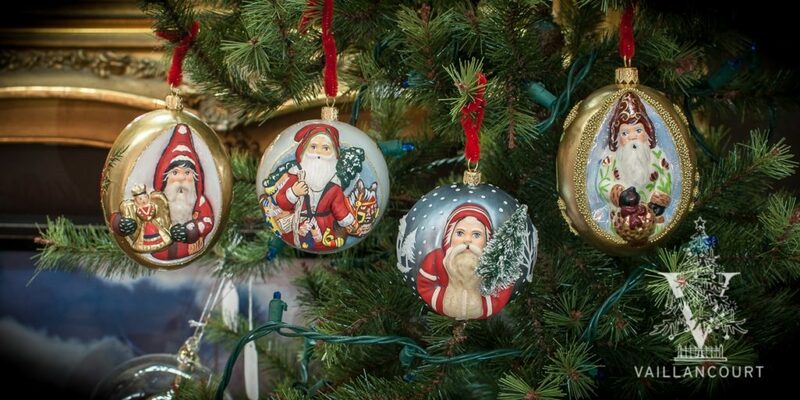 Vaillancourt Folk Art’s Retail Gallery in Sutton is decorated with all of the splendor of the Christmas season.